I'd had a vague idea of following the Dollis Brook for a while, and few months ago I thought I'd do a section along it's 'greenwalk' whilst killing time prior to a concert in the evening. Just a shortish walk, nothing epic. So this post recounts events from the Autumn as remembered 6 months later. I had last been in Finchley about 25 years ago when I lived there when I was a student at the Polytechnic (later University) of North London. Back then I wasn't even aware of the Dollis Brook or that it flowed through Finchley very near to where I had lived. I'd never explored the area very much at the time. Cursing the young Mr H's lack of perambulatory curiosity, I felt a need to revisit the area. I wanted to find the viaduct in nearby Mill Hill too. Rather than catch the tube straight to Finchley Central I took the opportunity to have a preliminary drift between Kings Cross and Camden. It was just before midday so I had a good seven hours spare time. 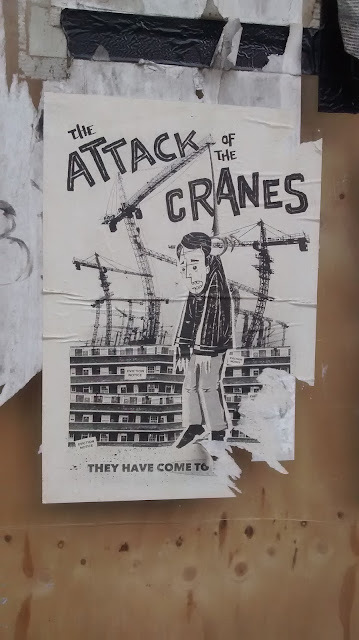 The development around Kings Cross has been relentless in the last few years but pockets of resistance and dissent still exist. Up the road at Euston Station the forthcoming HS2 (High Speed 2) development is destined to have an even bigger and more negative local impact than that at Kings Cross. Residents will be displaced. Relocation is promised nearby but whether this will happen remains to be seen. 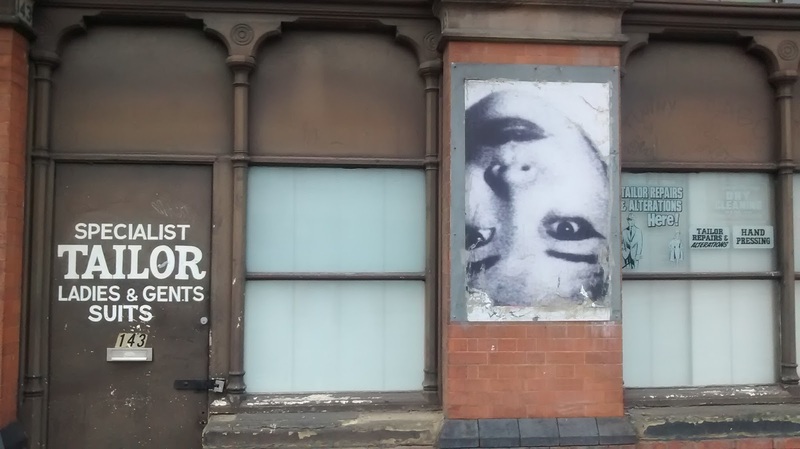 The excellent Bel Poori restaurants of Drummond Street are under threat. 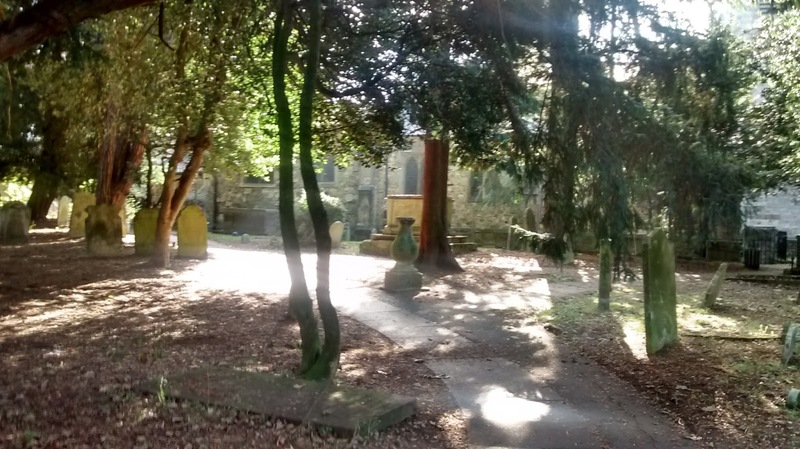 Graves are being exhumed in a public garden destined to disappear and be buried itself under one of the new entrances. Meanwhile, carrying on towards Somers Town I wasn't sure if this tailor had abandoned the premises or had barricaded him/herself inside. 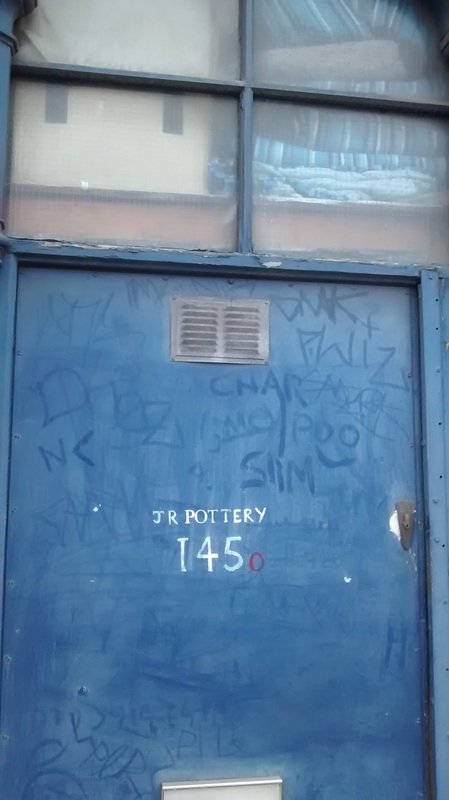 At number 145 it looked like JR Pottery had discarded the kiln in order to supply emergency blankets. Not long after this I got to Camden and caught the tube to Finchley Central. 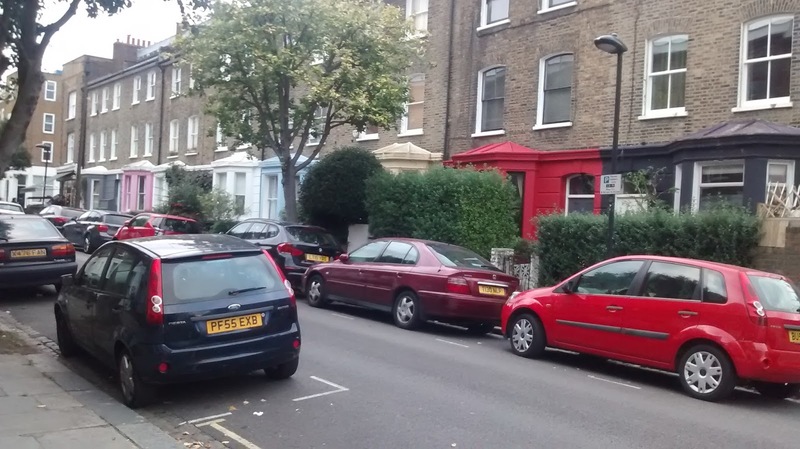 I walked up the main drag, Ballards Lane, taking a diversion into Victoria Park to try and find a convenience. There was one but it was locked. I left the park being too distracted by natures call to explore it properly. I'd never been there when I lived in the area. Back on the main road I was drawn into a side passage known as Lovers Walk. No sign of anything amorous occurring but maybe that only happens at night. It looked to be in the right direction for the Dollis Brook and there was a possibility of finding somewhere to have a pee. I emerged onto a residential street. A bit further down it I followed the sign pointing down a pathway which was a continuation of Lovers Walk. 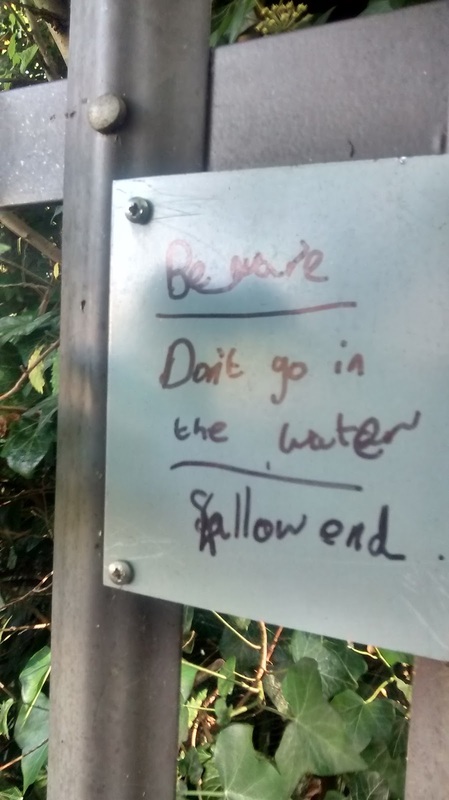 I guessed this would lead me to the Dollis Brook. But by this point I'd decided I'd drift in whatever direction took my fancy, and if I found the Brook it would be fortuitous but not longer essential. 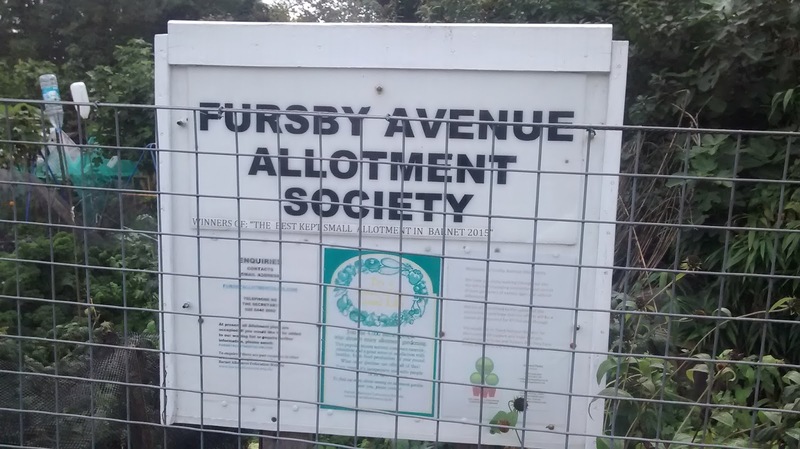 Soon I did reach the brook and followed it along until taking a diversion past the Fursby Allotments: 'Best Kept Small Allotment in Barnet 2015'. A worthy accolade, but it was now 2016. Where was the currently title holder I wondered? Maybe a future walk tracking the allotments of Barnet would be a good excuse to come back another day. As far as I am concerned allotments are magical spaces and in more ways than one. Anyone who has one will probably tell you that upon entering an allotment site you are instantly in a different place physically and mentally. Any stress and anxiety seems to dissipate as you pass through the gate as if you have entered parallel dimension of calm and equilibrium. They are also miraculous in their continued existence given the pressure from developers and land grabbers. But many have been lost including one recently in nearby(ish) Watford. They represent a healthy 'up yours' to the idea of relentless property speculation as the best use of land...maybe that's another reason it feels good to have an allotment. The resurgence of interest in them among all sorts of people in recent years has been important in helping reduce their loss. It has also meant that they are no longer only inhabited by the stereotypical easy going old men in flat caps, although gladly they are still about to offer their wisdom. My memory of events here feels somewhat unreliable - there is a bit of a gap in the photographic record and a cheating look at google maps hasn't helped me really. So I will write as I remember. This might lead to an account not quite on par the reality of the route taken but the one that is in my brain a few months after the event. And therefore a more pure if distorted version of events. I emerged into a green space following the Dollis. This was clearly a popular place to bring children and walk dogs. Not really wanting to be surrounded by either I diverted down a side way leading to a road..possibly the one I had crossed earlier. I had it in mind that this road would lead to Mill Hill East tube station. I passed a crossroads with a handful shops and a couple of busy cafes. I half recognised this from my Uni days of 25 years ago. 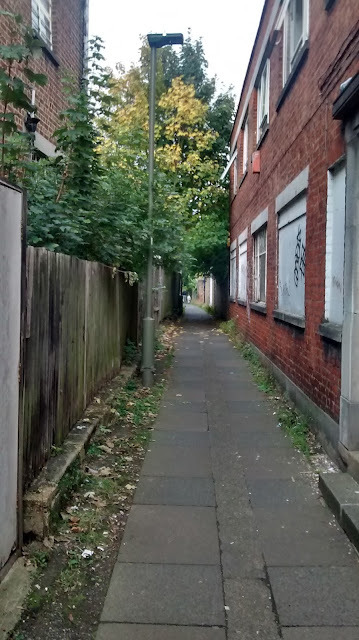 The scene sparked a vague memory of trying to walk to Mill Hill East back then and never reaching it. I remembered these shops but never finding the tube station. Again when I got to this place I initially thought I might be at Mill Hill East. It wasn't of course and I carried along the road. Looking at the map now this was probably Lullington Garth but I'm not 100% sure. Carrying on I soon found myself in what was beginning to resemble countryside. I found a stile into a field and felt compelled to climb over it. 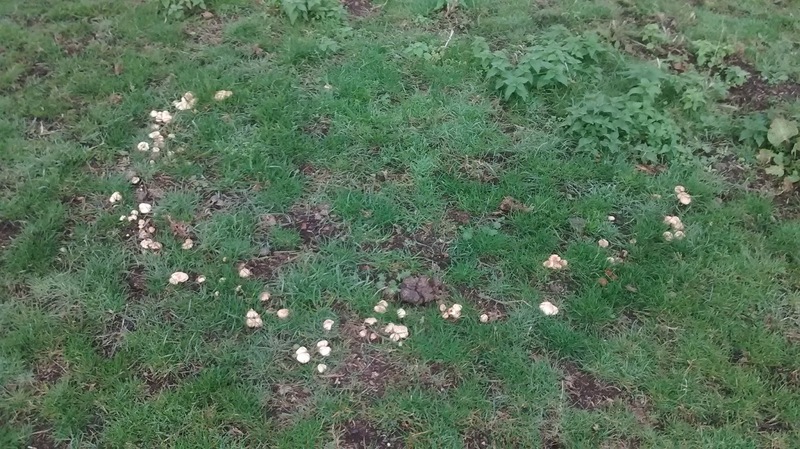 There were several mushroom rings in the field, this being Autumn. In European and British Folklore these 'fairy rings' are usually considered dangerous if entered. One legend has it that 'someone who violates a fairy perimeter becomes invisible to mortals outside and may find it impossible to leave the circle. Often, the fairies force the mortal to dance to the point of exhaustion, death, or madness'. While the idea of becoming invisible is quite appealing when doing a walk, I was never much of a dancer to being with. I skirted round the rings just to be on the safe side. In the distance I could see what thought was the Lloyds Bank buidling in Cockfosters. 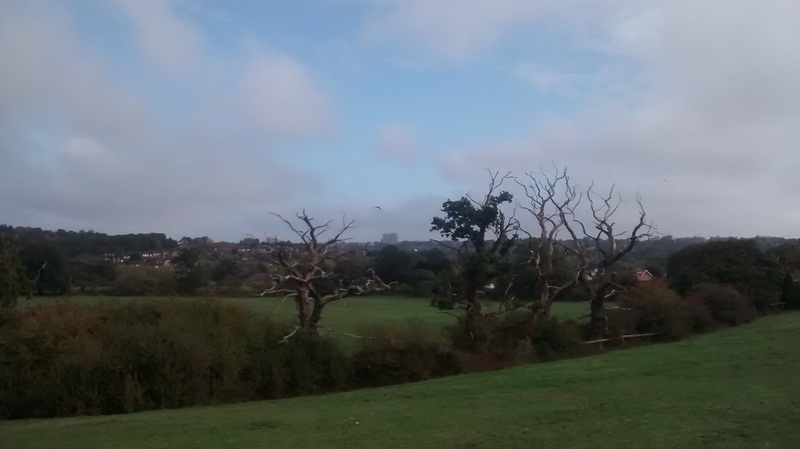 The tentacles of world finance are never far away even when dodging fairy rings in a field in Barnet. On an earlier walk I did with R, our destination had been East Barnet but we saw the looming white building in the distance and decided carry on until we reached it. 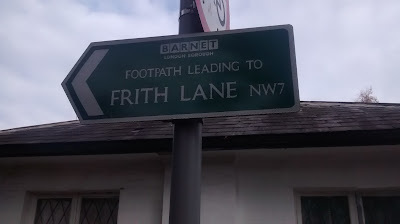 It seemed like a beacon in the suburban hilliness of Barnet. It was less palatial and impressive close up than from a distance but still the dominant feature in the immediate environs of Cockfosters Tube. One which seemed to mock our vain efforts to find liquid refreshment at the end of our journey (we couldn't find a pub near the station). I noticed some of the trees appeared petrified. Maybe they were cursed..by fairies or bankers. Or maybe dead. Or maybe they were supposed to look like that, I'm not much of an authority on trees. Across the field I climbed another stile and entered what looked like a farmyard. I saw people with children on horses. I followed the footpath signs across another field and into a paddock. This contained a couple of large horses and no apparent way out the other side. Retreating from the paddock, I retraced my steps as no other obvious pathway presented itself. I have a sort of unwritten rule never to double back on a walk unless there are exceptional circumstances. But horses can be dangerous and I'm a coward. This was an exceptional circumstance. 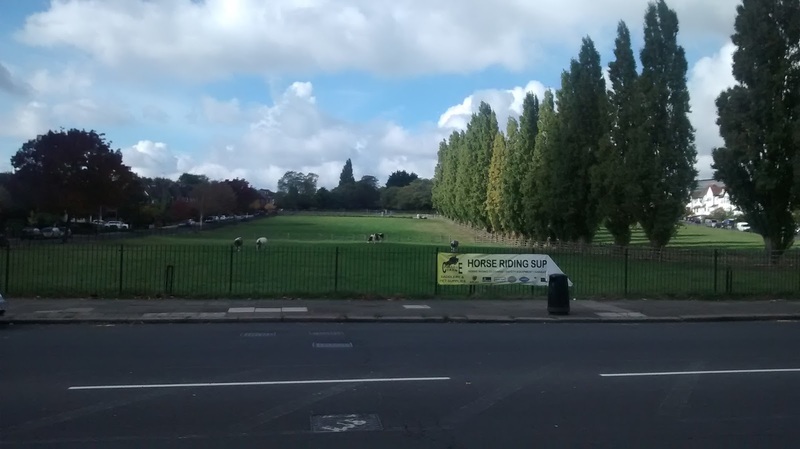 Back on the main road, I soon saw that the reason for the proliferation of all things horsey was the Frith Manor Equestrian Centre'. A bit further up the road I passed this mysterious obelisk. Passing Finchely Golf Club I suddenly recalled this road from my attempt to walk to Mill Hill East in my student days. I remember at the time this being a seemingly endless road with trees and fields with an army base or shooting range and possibly a farm My vague memory was at least part right. Inglis Barracks used to exist nearby but the site has since been given over to a fairly typical looking residential development only remarkable by it's non-remarkableness. 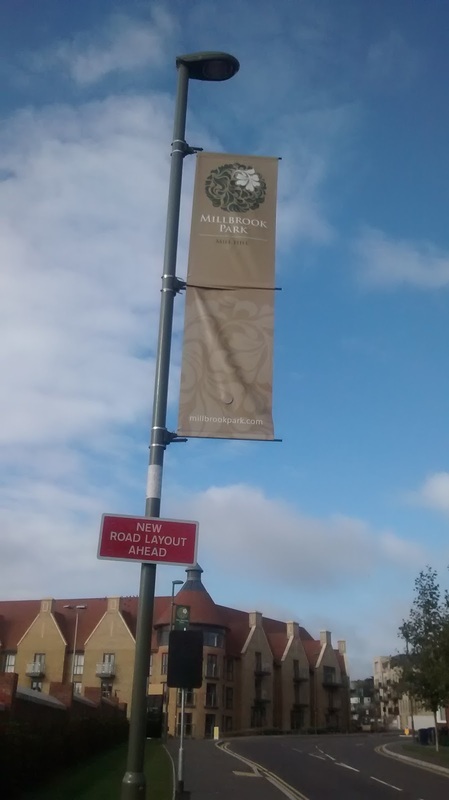 Millbrook Park was a result of something called Project MoDel which basically involved the Ministry of Defence divesting itself of sites considered surplus by selling to housing developers. I guess houses are better than war. 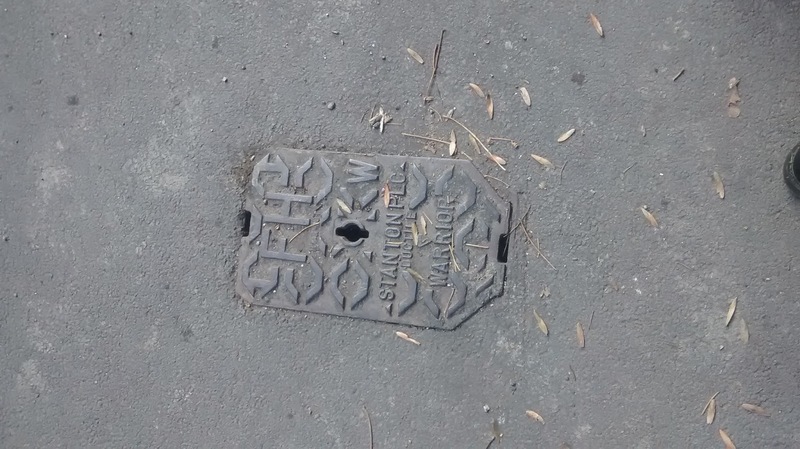 It seems even manhole covers have to be called something. I came across this one labelled 'Warrior'. 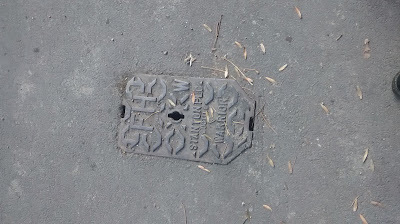 Other names for manhole covers include 'Saunders', 'Aptlas Double' and 'Bulleseye' although these ones are more subtle and dignified, not feeling the need to display their brand to the public. Those who need to identify and deal with the various Thames Water manhole covers safely have this booklet to refer to. These field officers hold the key to an unseen world of underground byways through these portals. Maybe they know the secret of the names given to the covers. 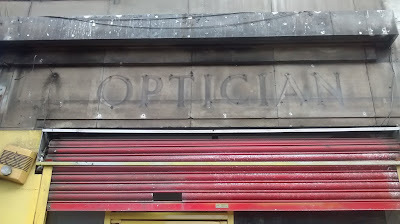 But to me they remain as random sounding and unexplained as those given to different models of glasses in Specsavers. Eventually I arrived at a crossroads with some shops and soon after rejoined the Dollis Brook (I think.I didn't bother to check the map). Then I emerged into some streets and followed a footpath to Dollis Avenue. 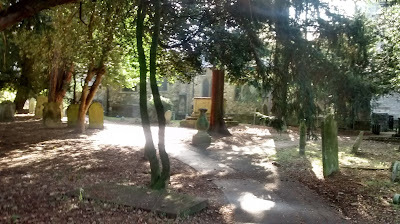 Somewhere soon after this I passed through a small secluded churchyard featuring an unusual urn type monument, possibly a grave, at it's centre. Symbolism in graveyards is something I ought to lean more about. According to the Graveyards of Scotland blog, 'An urn is the epitome of elegance, class and style and had soon replaced the skull and crossbones on many graveyards in Scotland and the world'. Not being one to care much for elegance, class and style I think that's something of a shame. Rested I carried on. Soon I realised I was back not far from where I'd began at Finchley Central. Rather than head back to Ballards Lane I took a pathway which ended at the entrance to Stephens House and Gardens, a place I'd never heard of. 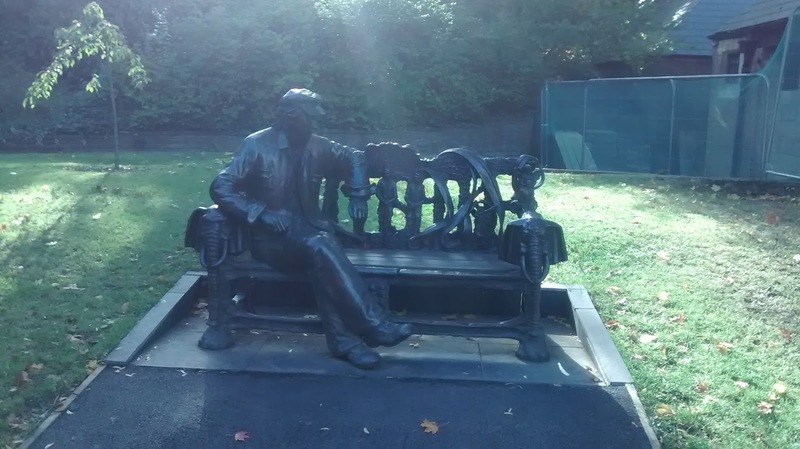 This contained a memorial to the comedian Spike Milligan who had lived in the area and been involved in the Finchley Society. The statue is called 'a conversation with Spike' and you are encouraged to engage in one and while taking in the various elements of the bench. These include elephant heads, statues of characters from the Goon Show and fairies. Spike apparently had a fascination with fairies and convinced his children they lived at the bottom of his garden. Hopefully they didn't fall foul of the mushroom rings. I did sit for a few minutes and wondered what bizarre anecdotes he'd be able to tell me about the environs and characters of Finchley in the early 70s. I'm sure he had plenty but he remained silent. Also in the gardens is 'the Bothy'. 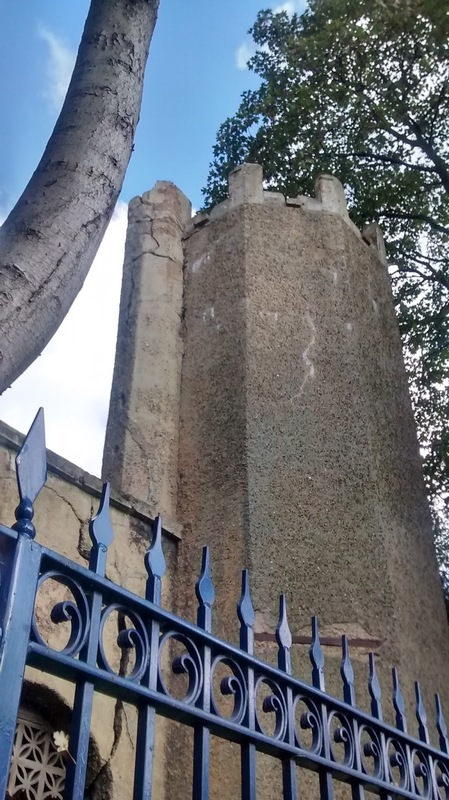 A Victorian folly under renovation. 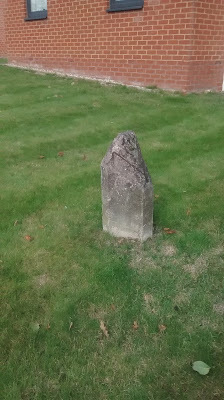 One of the first non-Roman concrete structures in Britain. I'd never really associated the Victorians with concrete but the view of one of its towers from outside the garden had a definite proto-brutalist feel to it. Heading South, away from Finchley, I passed this green in what was otherwise quite a built up area on Regents Park Road. I was surprised to see cows in this setting but they were defiantly there. Over the road this building featuring 'danger of death' dates from the days of Finchley Borough Council. 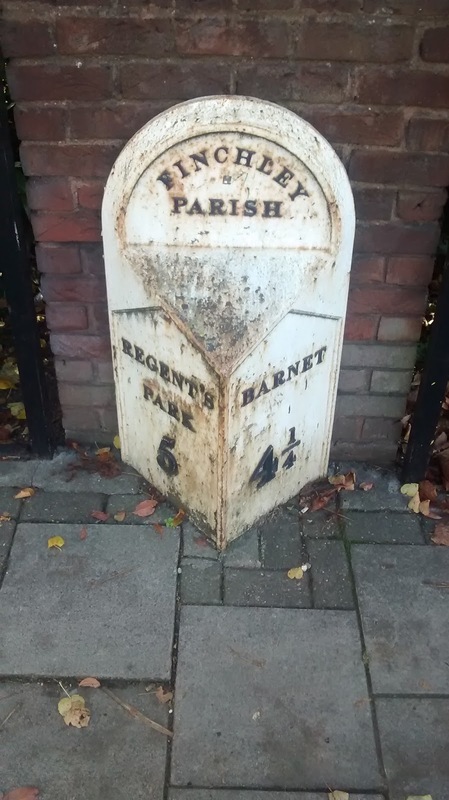 This organisation disbanded in 1965 when the Borough of Barnet and swallowed up Finchley. I wondered what the faded white rectangle symbols represented. 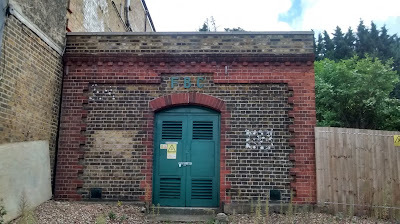 Had always only been an electricity room or had Finchley Borough Councillors had utilised it for other purposes. 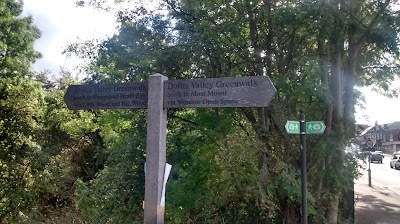 After crossing the North Circular Road I realigned with the Greenwalk for a bit in the direction of Hampstead. Hampstead was my destination for the evening so I wanted to avoid going there for now. I thought I might be able to skirt round it's edges and head towards Kentish Town to obtain liquid refreshment for the concert later. I had been advised there would be an interval and to 'bring what you like to drink'. I planned to visit the Clapton Craft beer shop to obtain supplies and visit the excellent Pineapple Pub for a relaxing post walk pint before heading to Hampstead, by bus or train. I was soon in Little Wood nature reserve..another place I had no idea existed. I'm not sure if I passed through Big Wood. I've since learned Little Wood contains an open air theatre, still in use. 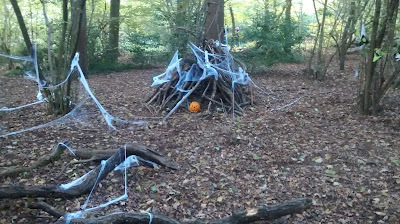 I missed that but did stumble upon evidence of premature Halloween shenanigans -it was October 22nd, not the 31st. 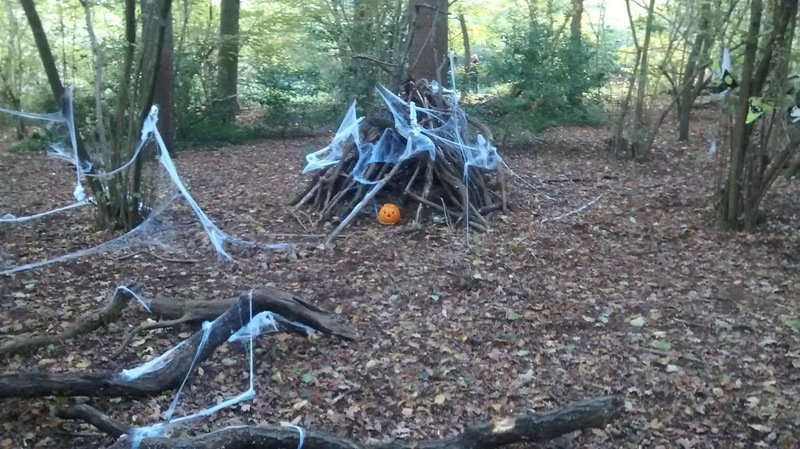 Possibly the people of Hampstead Garden Suburb consider their Winter Fair of greater significance and Halloween is pushed back a week. I misread the notice below at the time. 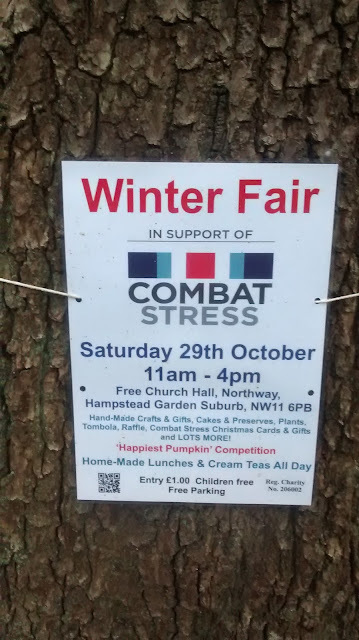 I thought it implied visiting the event would reduce stress which seemed a bit of a bold claim. It turns out Combat Stress is a charity for helping war veterans with post traumatic stress disorder and other stress related afflictions. This bizarre letter box was on the wall surrounding a particularly big house, even for round these parts. The Lion is a symbol of 'strength, courage and majesty' used since Roman times and is a popular design for door knockers in the UK. 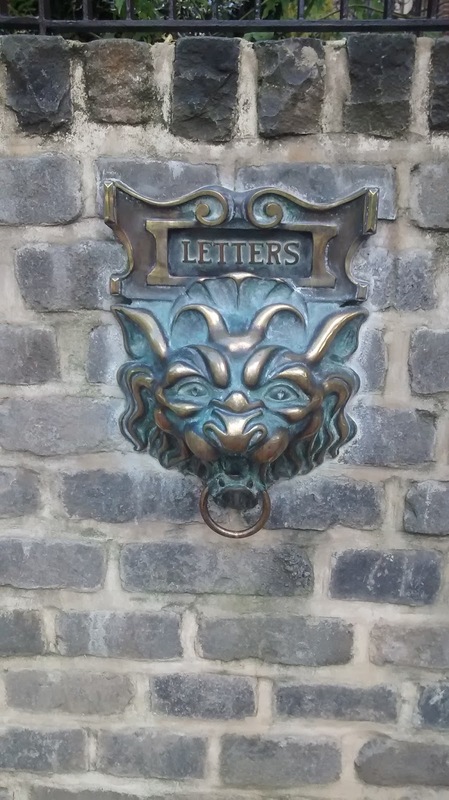 The letter box reminded me of the Green Man or foliate head carvings found /in churches as much as a Lion. Eventually I was out of Hampstead Garden Suburb and heading towards Swiss Cottage. I don't recall much of the walk between the two except that by this point I was beginning to regret wearing new boots. I had only planned a shortish walk but I hadn't turned out that way and my feet were beginning to feel it. 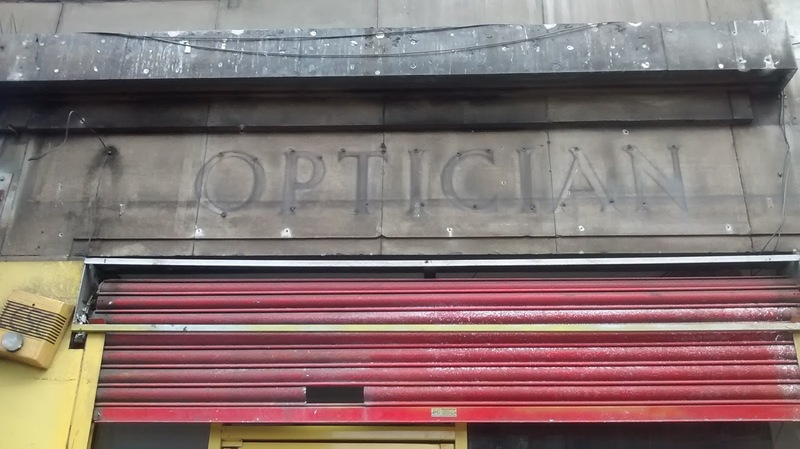 I passed this ghost sign for an optician on the main street having left the foliate suburb to pass into a more down to earth albeit less leafy area. At Swiss Cottage tube station it was nice to see that beverages were not being provided by the usual suspects. 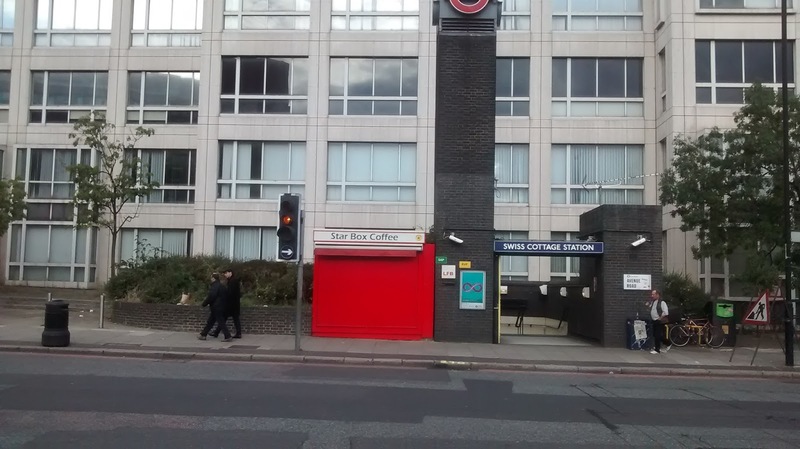 The Star Box Coffee stand, painted telephone/postbox red, seemed defiant to the blandification and homogenaity usually found. From Swiss Cottage I headed towards Camden and Kentish Town. 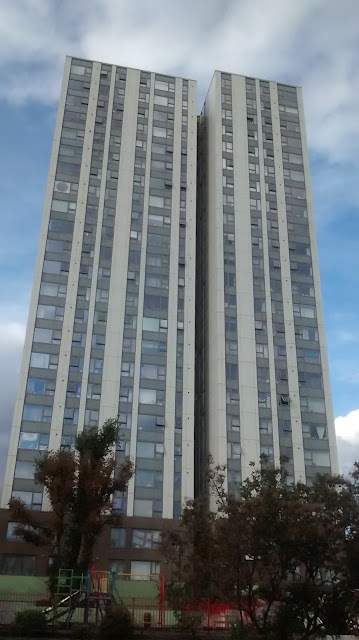 I passed this high rise in a street mainly made up of older houses. Having never been inside a high rise flat I wondered what it would be like..the higher floors of these flats must afford spectacular views across London, in the direction of Primrose Hill and Regents Park. 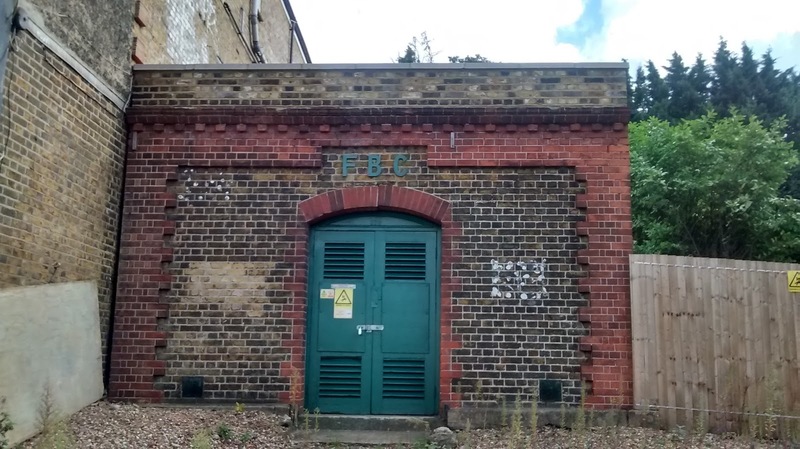 I don't know the demographic of this particular block but, although this block is not quite Belfeon Tower or Trellick Tower and probably not a target for the National Trust, I would guess the story is (or will be) similar. One of the original people it was built to house being displaced by those with more money. After a while I found myself on Prince of Wales Road heading into Kentish Town. This vaguely familiar territory for me. The Polytechnic/University of North London had a building there..an ex school I think. This was a bit out of the way of the rest of the Poly/University based mostly in buildings on or near Holloway Road and I only went there about three times. 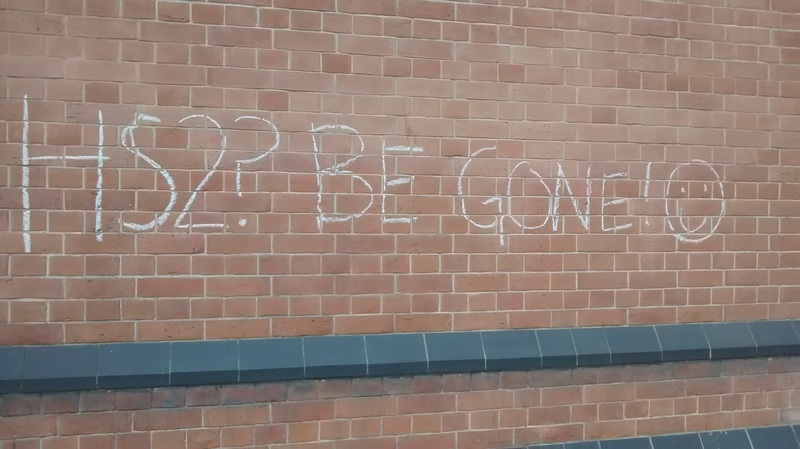 Probably the most famous Alumni of the Poly is Jeremy Corbyn who left/got thrown out after several disagreements with his tutors before finishing his course. 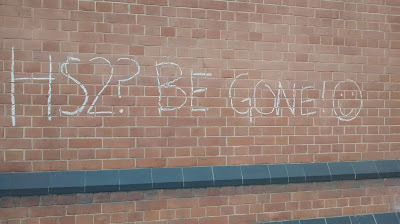 There was quite a bit of left wing student politics going on when I was there, so maybe he left his mark. The only other famous alumni I can think of were the band Lush who had left just before I arrived in 1991. It had been turned into flats by the time I next returned to the area just after the turn of the millennium, when I stayed in a B&B over the road. I'd picked Michael's guest house from the Yellow Pages. Can hotel booking really have not existed then? 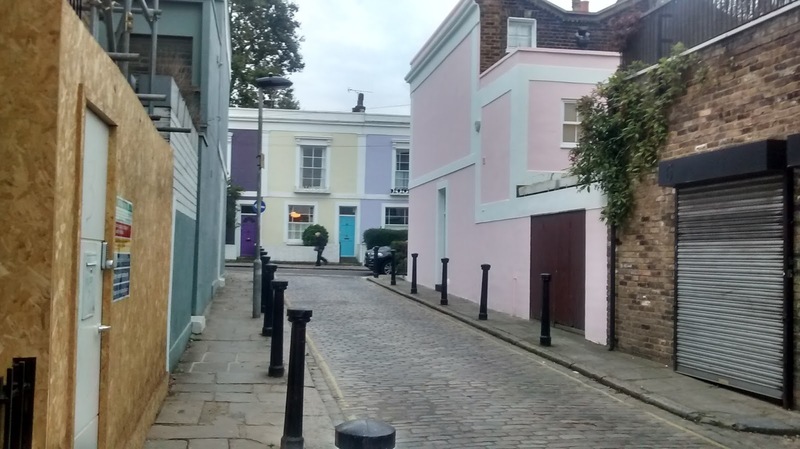 It is now called Camden B&B and it looks a lot smarter - if not a little odd-from the outside, painted white with coloured stripes. 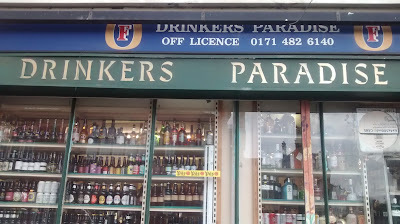 I had not bargained on encountering the Drinkers Paradise shop. Here I stocked up on a couple of beverages for later. I was attracted by the display of decent beer in the window. The Fosters lager logo and 0171 number, displayed on the old sign, would have been contemporary of my time at the Poly. The old and new signs seemed to represent both an increase in the availability of decent beer (hooray!) and rampant gentrification (boo!) that has happened since the era of the 0171 number - I suppose I have to grudgingly accept that the former is a symptom of the latter. As I'd reached Kentish Town with plenty of time. I headed to the aforementioned Pineapple for a pint and to rest my feet which were now feeling it, mostly because of my poor footwear choice. Following the side street off the main drag of Kentish Town brought me to the stark contrast of the quiet road of smartly and brightly decorated houses on which the pub is located. I found a quite corner and escaped from the world for a while. I had intended to get a train from Kentish Town West but that seemed in the wrong direction, and I decided to walk towards Hampstead. This part of the walk was not that eventful..I was weary and was looking out for a bus to take me to Hampstead. 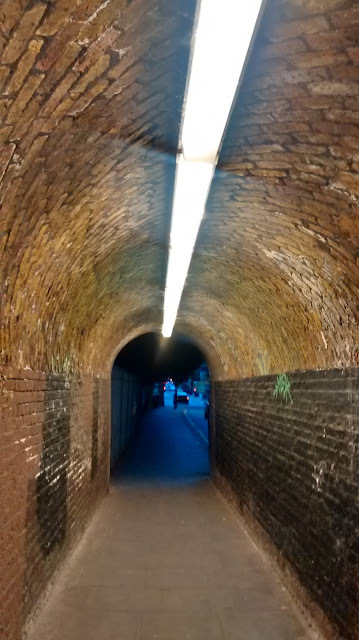 I made it to Gospel Oak after passing through this tunnel and the dolls shop below. 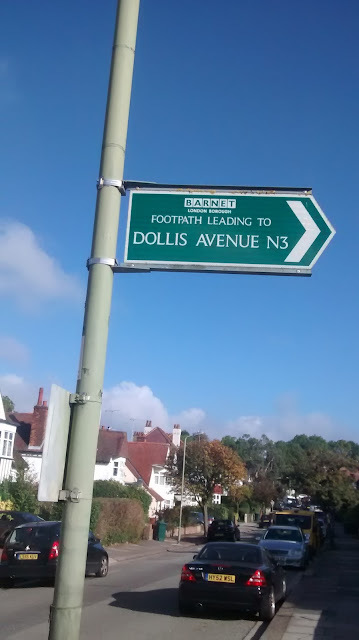 I'd been past the dolls shop before and had assumed it was closed up. 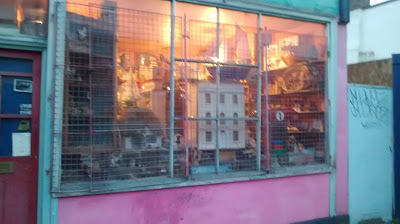 The bizarre objects in the window looked like it had been abandoned years ago and were covered in dust. It was reminiscent of a combination of the shop from the children's TV programme Bagpuss and The Victor Wynd Museum of Curiosities. On that occasion it was Sunday but this time it was very much opened for business, although the cage was kept up on the window. I've since discovered a couple of short films about the shop and it's eccentic octogenarian owner, Kristin Baybars. 'The Little Shop in Gospel Oak' and this one from the London Film School show what I missed by not going in. 'We do not exist, but of you think we do please knock' reads a sign on the door. I wish I had. I caught the overground train at Gospel Oak, a feeble one stop to Hampstead but I was knackered. I was a bit early so visited the White Horse pub. I remembered the name as a place that used to put on gigs back in the day by bands like Silverfish. There was no trace of anything as energentic and rawkus as that happening here now. 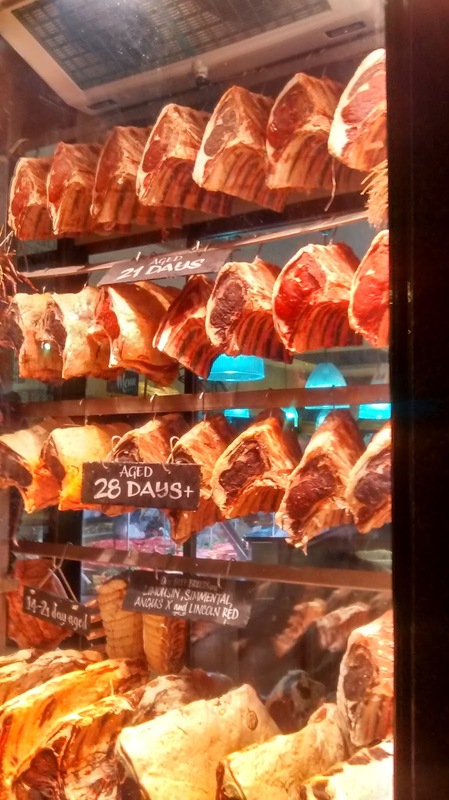 I headed up to the Rosalyn Hill Chapel to the concert, and treated myself to a posh pork pie to go with by beer at the interval, from a posh deli/butcher shop nearby before going in. The Dollis Brook Greenwalk would have to be done properly another day. Possibly.